I enjoy reading theSkimm each weekday morning for the latest news as I commute to work. While theSkimm gives you a fun way to read your morning news, learn trends and win prizes, ABC News is now giving you a quick way to watch the news each weekday. 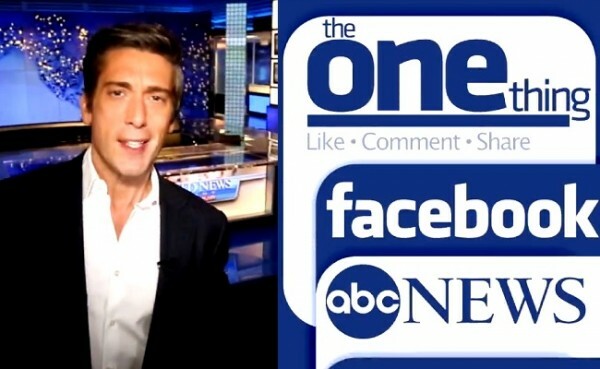 ABC News announced the launch of a social media newscast on Facebook hosted by World News Tonight Anchor David Muir. Facecast: “The One Thing” is a one-minute video news update on Facebook each day. Like theSkimm you receive a round-up of the day’s top stories and trending topics. Watch the first Facecast here and follow ABC World News Tonight on Facebook for #TheOneThing you need to know.